NatureMade Biotin Review - Does This Product Work? The following is our review of NatureMade Biotin. Biotin is a B vitamin that supports carbohydrate, protein, and fat metabolism. It may even be able to help support healthy hair, skin, and nails for many that suffer from biotin deficiency. This product claims to be able to help restore healthy biotin levels in adults with usually very low levels. It is made from carefully selected ingredients and under strict manufacturing processes. Continue reading for our full review. There is 5,000 mcg of biotin in 1 serving of this product. Biotin helps boost carbohydrate, protein, and fat metabolism while also supporting healthy skin, hair, and nails. The supplement also contains soybean oil, gelatin, glycerin, yellow beeswax, water, soy lecithin, and colors were added. The colors in this product are derived from natural sources. It contains no artificial flavors, preservatives, yeast, starch, or gluten, but it does contain soy. 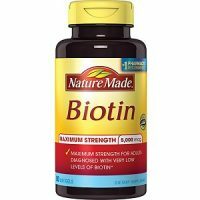 How Do You Use NatureMade Biotin? It is recommended to take 1 softgel a day with a meal. To make the swallowing process easier, you can drink water before and while consuming this product. You should consult your healthcare professional before using this product. Do not exceed the recommended dose. If you taking any other medications please speak with your doctor before taking this supplement since dietary supplements and prescription medications may not work well together. 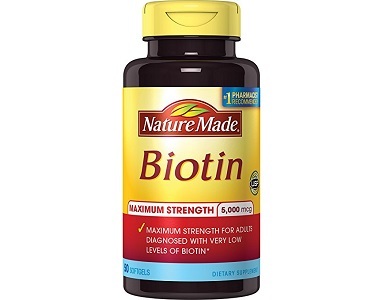 NatureMade Biotin can’t be purchased directly from the manufacturer. You can buy a bottle of 50 softgels for $6.99 and a bottle of 120 for $15.97 from Amazon. The product will last you about 1.5-4 months depending on which bottle you purchase. As you can see, this is a very affordable product. This product is not backed by a manufacturer’s guarantee since it can’t be purchased directly from them. This shows us that the manufacturer has a lack of confidence in their product’s effectiveness. It also doesn’t allow the customer to have a risk-free buying experience. You will need to look into the chosen retailer’s return policy, before buying from them. There are a couple of positive things about NatureMade Biotin. It can be purchased for a very affordable price. A lot of customers left positive reviews for this product. Many said it helped increase their hair growth and strengthen their nails. One customer even said they feel like Rapunzel since using this product. There were a couple of negatives as well. This product isn’t sold on the manufacturer’s website and therefore they do not provide a manufacturer’s guarantee. This shows that they don’t have much confidence in their product’s effectiveness. It also doesn’t instill much confidence in their potential customers. There were also some customers that said this product caused them to break-out in acne. Another customer even reported that their bottle came with only 39 softgels instead of 50. We feel you will be better off looking for another product elsewhere.